The 2019 Toyota Sequoia is one of the most capable SUVs in the Toyota lineup. With a larger interior footprint and towing capacity than the Toyota Highlander, the 2019 Toyota Sequoia is great for large families who need serious hauling potential and the ability to tow. For 2019, the Sequoia offers seating for up to eight passengers and the ability to tow up to 7,400-pounds depending on configuration. Base models have a starting MSRP of $48,700 and a long list of standard amenities including LED lighting, a moonroof, a roof rack, a power rear window, tri-zone climate control, standard active safety, and more. With four trim levels and multiple add-ons and optional packages, it’s easy for three-row SUV shoppers to find a 2019 Sequoia to love. Browse the current 2019 Sequoia inventory available at Fox Toyota near Knoxville, TN by clicking the link below. The 2019 Toyota Sequoia is the perfect tool for hauling the family to and from weekly appointments or on an adventure come the weekend. To help keep everyone safe and comfortable, the 2019 Sequoia is filled with a variety of available features like the standard Toyota Safety Sense active safety bundle and rear-seat controls, so there is no bad seat in the house. Take a look at some of the 2019 Sequoia’s offerings below. 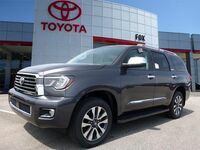 For more information on the 2019 Toyota Sequoia lineup or to see new models in person, Knoxville and Clinton-area residents can visit the Fox Toyota dealership. To connect with a Fox Toyota team member online, interested parties can also fill out the pop-up form below.